An adventure studio southwest of Warsaw called Flyspot, which normally specializes in zero-gravity flight experiences, is set to open the deepest pool in the world this year, stealing the crown from Italy’s Y-40 Deep Joy. The pool, which is called Deepspot, will stretch 148 feet to the bottom, contains 27 times more water than a standard 25-meter pool, and requires an astounding 1,100 tons of steel for construction. For reference, popular marine sinkholes like Belize’s Great Blue Hole stretch up to 400 feet below the surface. But a standard trip takes recreational scuba divers only 130 feet below the surface. Deepspot will be “regulation,” then, and should make a fine spot for divers of all skill levels to learn and hone their skills. The concept reminds us a bit of Kelly Slater’s wave pool, where surfers can catch perfect waves without the perils of the open ocean. That concept has spawned numerous knock-offs, and it appears that will be the case here, as well. 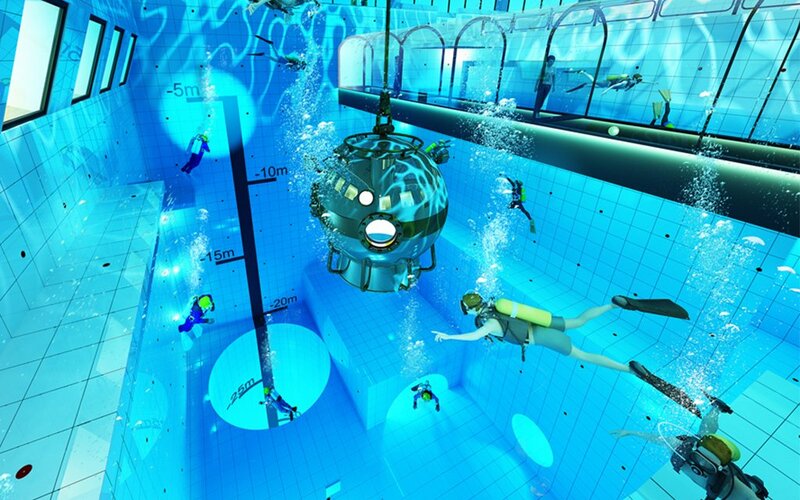 There’s already a deep pool under construction in the United Kingdom called Blue Abyss, which will be 164-feet-deep. We say the more the merrier. Scuba diving is dangerous, especially for beginners. Mastering equipment and negotiating bizarre side effects from excess nitrogen and a lack of oxygen will be easier in a environment safe from predatory marine life, albeit less exciting and beautiful. 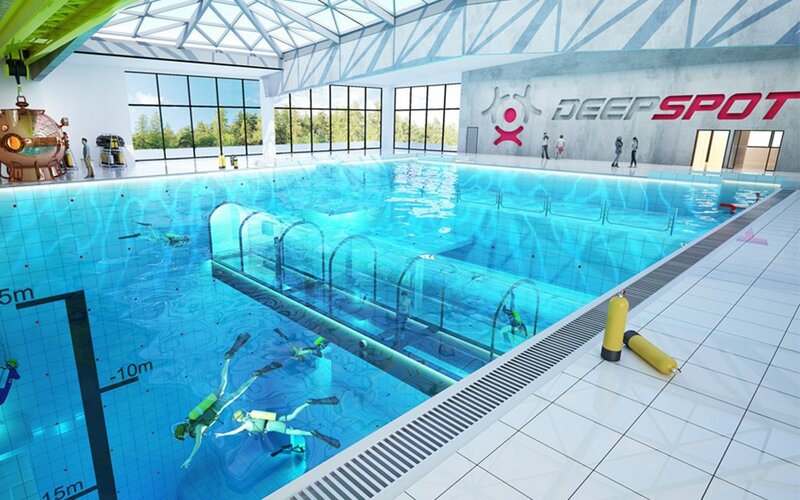 Still, what might help set Deepspot apart in the indoor scuba trend is its all-inclusive approach. 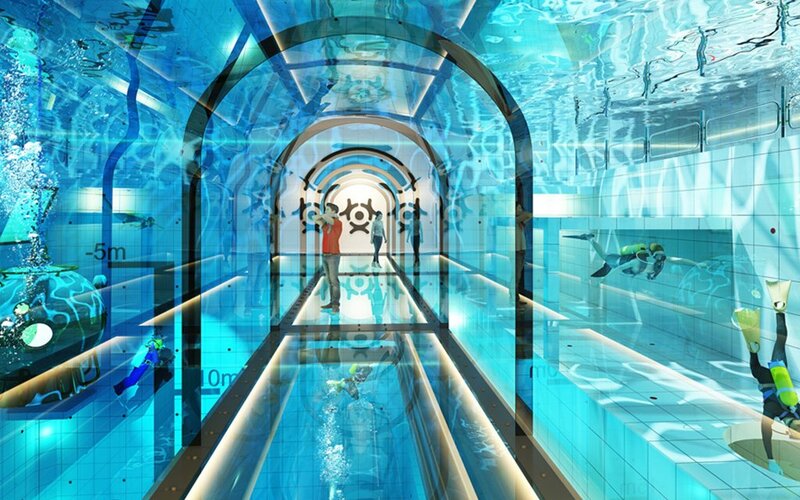 Those uninterested in scuba can walk through reinforced hallways that bisect the pool, stay in rooms below the pool’s surface, or just try Flyspot, which looks pretty epic. For more information on the pool, head here.